Use a serrated blade to chop the chocolates, setting each into a separate container. Place the mini baking cups in a large container. In a sauce pan on Low, melt the white chocolate and half of the peanut butter, stirring until smooth. Spoon mixture into baking cups, filling about halfway. Shake each cup so the chocolate settles, and refrigerate 10 minutes. In a fresh sauce pan, on Low, melt semi-sweet chocolate and half of the peanut butter, again stirring until smooth. 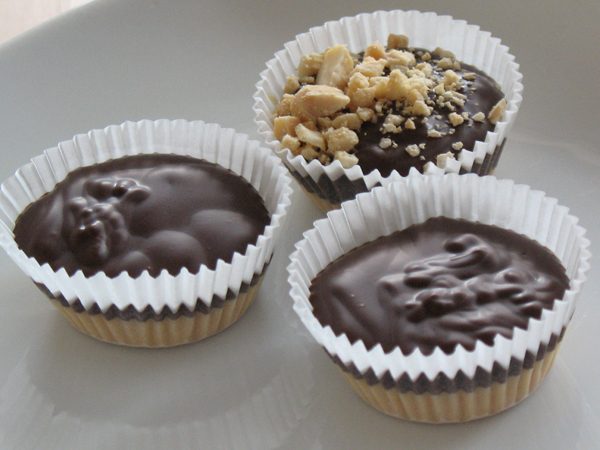 Pour the semi-sweet chocolate onto the chilled cups, again shaking them to settle. If desired, sprinkle crushed nuts on the top.